As a Sophomore at Harvard, in 1956-7, I audited an introductory course on computers. That is where I wrote my first program, for the Univac 1. 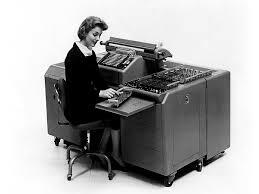 In this course we studied a number of machines, from punched card tabulating machines to the Univac. The most unusual of these machines was the Burroughs E101. The E101 was a weird amalgam of manual calculator and computer. It was a desk-sized machine with what looked like an ordinary four-function electromechanical calculator in the center of the desk, and a set of pin boards set into the surface of the desk to the right of the calculator. The machine was programmed by inserting pins into holes on the pin boards. There were 8 pin boards each holding up to 16 instructions, giving a total capacity of only 128 instructions. Each of the 8 pin boards could be invoked manually from the calculator keyboard to perform some calculation, or all 128 instructions could be used for a program to run automatically. The photo shows an operator programming one of the pin boards. Data memory was a magnetic drum with a capacity of 100 numbers. The instruction set included conditional branching so the machine was Turing-complete. The E101 was electronic, with 160 vacuum tubes, 1,500 diodes, and about 20 relays. the calculator-like input-output device appears to have been electromechanical. The E101 consumed 3Kw of power. The E101 was in prototype in 1954, so it probably hit the market in 1955, the year I entered Harvard as a Freshman. It cost $32,500, which is $285,000 in today’s money, much less than a real computer cost then. It was slow. It could do 20 additions or 4 multiplications per second, and could print two words of 12 digits each per second. The E101 was not a success commercially. Why am I not surprised? This entry was posted in Rudd's Blog, Uncategorized and tagged Burroughs, computing history, E101, Harvard, UNIVAC. Bookmark the permalink.